Big News!! Our pricing guarantee has been extended through the end of the year. You can get this exclusive offer now through December 31, 2015! Don't get lured in by others who want you to sign with them because of their low, low prices; only to have them jacked up a few months later. Springs Cleaning doesn't operate that way. Our pricing is as low as anyone else's, but the difference is we guarantee it. Also, check below for details on our supply replenishment program. When we sign a contract with our customers, it's just that, a contract. We do not raise the price of our janitorial services unless every other avenue has been exhausted. Our existing customers can attest to that. We can guarantee that we will not raise the price of our services for at least two years, but quite possibly longer than even that. No other service in Colorado Springs offers this to all new customers. Take the worry and headache out of keeping your facility clean and your restrooms stocked with the all-inclusive Supply Replenishment Program available from the experts at Springs Cleaning. Our pricing is extremely competitive, saving you money and also eliminating the hassle of tracking and reordering supplies. Let us handle this mundane task for you so you can focus on your work. 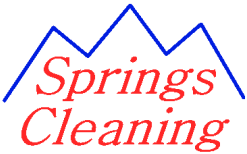 It's just one more reason to choose Springs Cleaning for your janitorial services.